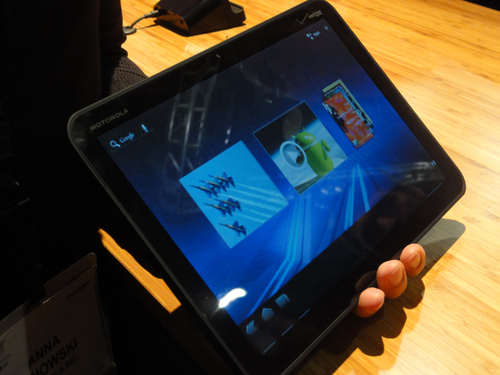 Motorola has been busy at Mobile World Congress, showing off its XOOM tablet but also meeting retail executives that want to sell the Android-powered tablet in their stores. Today, Motorola has announced a number of European retailers that will introduce the XOOM at launch; The Carphone Warehouse, Best Buy and Dixons Retail (which includes Dixons, PC World and Currys) will offer the tablet in the UK, whilst Deutsche Telekom A.G. (parent company of T-Mobile) will sell the XOOM in Germany. There’s no word on pricing but the 3G/Wi-Fi version of the XOOM will launch with The Carphone Warehouse and Best Buy and the Wi-Fi only device will launch with Currys and PC World, in the second quarter of 2011. Earlier we reported on Motorola’s pricing strategy for its XOOM tablet in the US, the 3g/Wi-Fi model coming in at a cool $800, pricing it higher than Apple’s iPad tablet. Motorola’s mobility chief Sanjay Jha, said that the tablets’ ability to deliver 4G speeds justifies a higher price that its iPad rival – something that might apply to German LTE networks but the UK has yet to roll-out the next-generation of mobile networks. That said, Jha did note that Motorola had failed in engaging European customers, so we could see a unique pricing structure in those markets.